A NEW and up and coming theatre in Romford is making quite a name for itself. The Brookside Theatre, in Eastern Road, Romford was the former Romford War Memorial Hall, and to celebrate its 60th anniversary it has been taken on by a young couple determined to put it back on the map, but this time as a theatre. Shut up for years, the hall was re-opened in October 2013 by Jai and Harri Sepple who had a dream. Taking advantage of a peppercorn rent, they brought their Stage One theatrical company, plus a lot of hard work, to the Eastern Road venue. Since the heady days of opening, there have been many touring and local amateur dramatic group shows, and soon the first performance of the former, Romford Operatic & Dramatic Society (RODS) once based at the venue, will be on July 1 to July 5 with a production of Hairspray. But before that, recently the resident group took on Godber’s BOUNCERS. The play is a now in its 47th year and notoriously difficult to perform, but the group of players at the Brookside Theatre turned out a good night’s entertainment. 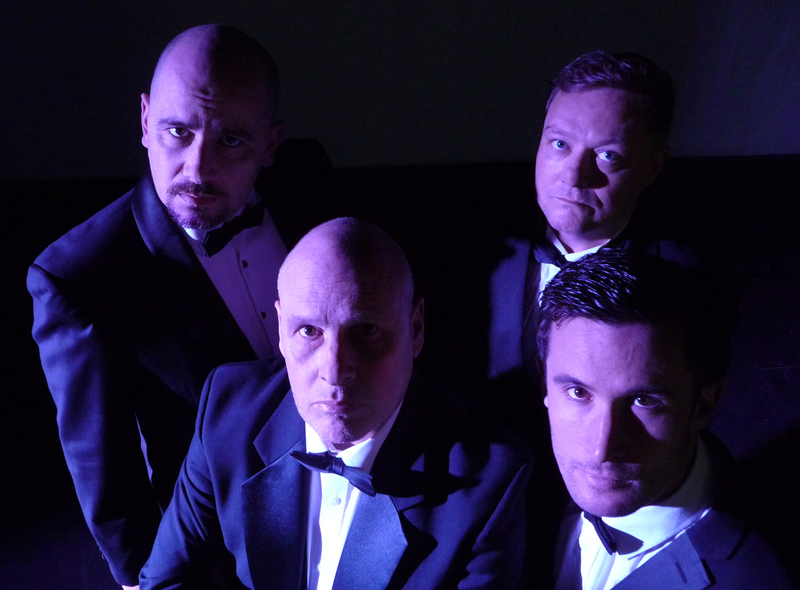 Originally written in 1977 and set in a Pontefract night club, this production was updated to Romford, and featured; Kevin Richards as ‘Lucky Eric’, Barry Hester as ‘Judd’, Paul Ewen as ‘Ralph’ and Jai Sepple as ‘Les’. The quartet put in a lot of work and produced a slick and interesting version of the play. However, The success of Bouncers not only lies in the multi roles taken on the four, but in the interpretation and usage of the original skilful dialogue. It turns the actors from bruiser bouncers, to nubile empty headed adolescent teenagers with pace and energy and all at the drop of a handbag. A tall order for hardened professionals, but given bags of enthusiasm, this production was translated pretty well, and certainly no one could complain they had not had value for money. But it is worth considering that bringing a play screaming and kicking into the modern day can have problems. Bouncers was written almost five decades ago and though theatre censorship ended in 1968, it was still subject to self regulatory taste of the era with censorship in line with that enforced on the film industry. Draconian by today’s standards, they were contained within tight parameters and a shopping list of can do and can’t do with the latter far out weighing the former. Though removed from theatre, the stigma lingered on and much to the frustration of many playwrights, their work still reflected a reticence to let go fearing a public backlash on street language. Writers like Godber and Ayckbourn used their creativity to circumnavigate these fears, still getting the same message across. A perfect example in the original Bouncers is the reference to the sexually explicit morals of some teenagers behind the theatre during the evening’s dancing. Lucky Eric’s line describing the car park as looking like a graveyard for dead Smurfs brought auditoriums to a complete standstill, while the audiences tried to control their tears and laughter. It is one of the best graphically descriptive moments spoken without profanity or swear words. Here lay the potential pitfalls of updating. Using some contemporary street language diminished the value of the original lines with a subsequent lower audience response, particularly towards the end of the play, the over use of four letter swear was harsh on the ear. However, in complete fairness it is common today to hear people use them as adjectives to describe every other word. My only observation is this did little to enhance the original story and dialogue other than produce a parallel play of 2014 which lost some of the elegant structures of 1977. It was fast and well rehearsed and, as said earlier, no one could complain about getting value for money. The birth of the Brookside is an ambitious project that has been fully engaged by husband and wife team, Justin and Harri, turning the old Romford War Memorial Hall, into a functional operating theatre. The enormity of the project can only be imagined but has justly received some luck after long hours of hard work and dedication. The duo have now nailed their theatrical group to the mast of the new theatre and expanded their own productions, as well as touring shows. With a strong programme of events, Brookside deserves to succeed.